This straight arm solution is capable of accommodating your single detector solution. It's also versatile enough to accommodate all other solutions that are on the market today. Positioning is quick and easy with a constantly aligned Bucky and X-Ray Tube. 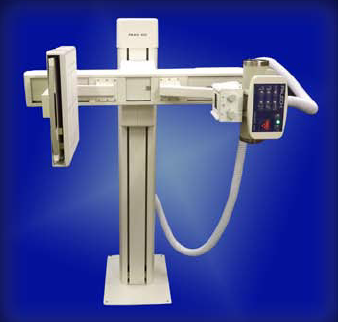 It has a motorized source to image distances of 40" to 72" with the ability to stop anywhere in between. With it's full range of motions, it's possible to perform skull procedures all the way to the lower extremities. It has a tremendous amount of flexibility. Due to it's unique free-standing design, the Paxis 100 provides a compact installation foot print, making it ideal for small room installations. All movements are controlled by clearly identified push buttons on the control console. Each motion is illustrated which eliminates any guesswork as to which motion you are calling for.